In every country there are people, so called “con artists”, they operate in China too. They will try to make you believe something which is not true in order to get your money. Ways how they do that are different but the main idea is the same: first they will stage some sort of situation which outcome will be transfer of money from your pocket to theirs. Some of those schemes are quite creative some of them are brutal (for example they can bump into you and try to put blame on you for some damaged goods and ask you to pay for it). In any event it is very important to remain cool, remember it is all about money, don’t take it personally. Think twice if something is worth physical confrontation, injury or lost time at the police station with people who don’t speak a word of your language. However, if you believe that your security is on the line don’t hesitate to contact the police (see below where “The Yangshuo Scam” is described. Sometimes characters like Larry in that story walk a fine line between scam and serious crime). study information on this web site carefully. Read the following examples which will help you recognize the ‘symptoms” of the scam unfolding. If you have already experienced any similar situations in China please share your story with other travelers at our bulletin board. This one is very frequent; in any bigger Chinese city you will come across at least one couple (usually it’s a boy and a girl) who will speak fairly good English and they may start conversation with: “Hi! Where are you from?” You may feel it would be rude just to ignore them so you will tell them where you came from and after that they will continue very friendly conversation (usually it’s “how do you like China?” type of conversation where again you would feel bad if you either stop conversation or say something that may offend them). After they establish some sort of relationship and gain a minimum of your trust they will tell you they are art students (usually from a distant city and they are only temporary in the city where the conversation is taking place, say Shanghai) and they would like to show you some of their paintings in the gallery near by. Most likely you will respond by saying that you don’t take interest in Chinese paintings or that you don’t have time but they won’t take no for an answer. They will keep insisting that you just take a look and that it won’t take long because the gallery is not far away, that you don’t have to buy anything. After you agree just to take a look they will take you to the gallery which is usually in one of the fancy downtown buildings, with one or two rooms full of traditional Chinese scroll-style paintings (and usually very low quality paintings too). They won’t spare effort, they will tell you a story behind each of those paintings taking you, basically, on a guilt trip ride because when the time comes to leave the “gallery” you will feel bad if you don’t buy anything. The best approach to this situation could be just to say that you don’t have time to check their paintings and they can give you their business card so if you decide to take a look you can give them a call later. Of course they will keep their pressure but you should stick to your decision. This is a fairly innocent scam. I have not witnessed this one myself but I have heard of it. What happens here is something similar to the previous scenario where “students” are selling paintings but in this case you often deal with one person (as opposed to a couple in the previous scenario) who speaks English, who is very friendly and at one point during your conversation offers to take you to a tea-house where you will be able to enjoy an original, age old traditional Chinese tea ceremony. Who can resist such a temptation? Traditional Chinese tea ceremony performed only for your eyes! But your eyes may be even more awe-struck when the check comes and you see the amount. What should not cost more than $20-$30 all of a sudden became $200-$300 and both the owner and your “lovely host” make a big fuss when you refuse to pay the bill. Pretty unpleasant situation to deal with. On way to deal with this situation is to ask the owner of the tea-house to write down on a piece of paper how much it’s going to cost before you agree to the deal. Then keep that paper with you and call the police if they try to rip you off (don’t forget the person who took you to the tea-house and the owner are in cahoots). Hopefully they won’t call in a fake police officer. This scam is more elaborate and more dangerous than the previous one. If you play along chances are you will get ripped off, the only question is to what degree. This is another case of scam that some travelers had reported and I read about it on some Internet forums. I’m not sure how frequently it occurs at this time (2007) but I’m sure a variation of one sort or another will be used in similar environments. Anyway, what happened was that some travelers were accosted by 2-3 gentlemen in smart suits at the airport and they asked them to pay some sort of airport tax. The way they looked and how they introduced themselves made those travelers believe they were airport officials. Needles to say they were not allowed to collect money for airport tax (surcharge) even during the time when such thing existed. Nowadays all taxes are included in the price of the airfare ticket so when you get to the airport you are not supposed to pay anything. You just check in your luggage, get your boarding pass and proceed to the boarding gate. That’s all. During my two trips to China I flew 5 times within China and not even once was I asked to pay any additional charge. The best course of action in this case probably would be to avoid the discussion away from the main check-in area and ask those gentlemen to proceed towards the official booths or even ask for the police office and ask them (the police) for clarification what is expected from you. The scammers will try to pick out those passengers who appear to be in a hurry with very little time to board the plane, hoping you will pay and leave the “crime scene” as soon as possible. If that happens just ignore them and keep walking towards the check in desk or if you have your boarding pass then walk towards the gate. If someone has some legitimate concerns they will follow you and when you reach the security check point before the boarding area they will speak with the security staff about it. If, on the other hand you have scammers on your tail then they will give up (it is not very likely they will get physical in such environment - deceit, persuasion and intimidation are their weapons of choice). This is what happened to my friend Elaine and I in 2005 at the Shanghai train station, around 8:00 PM. 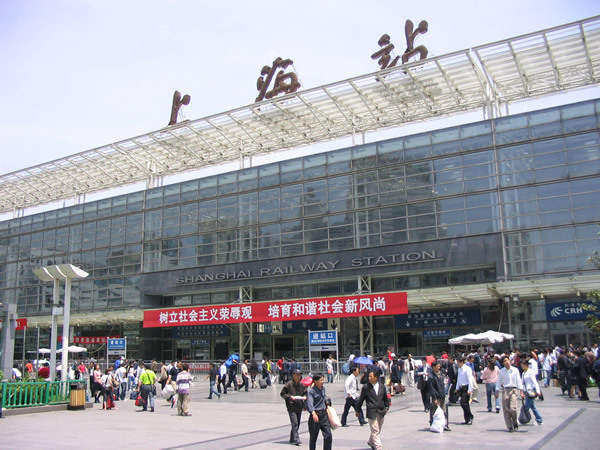 We went to the train station to purchase train tickets for our trip to Hangzhou which we planned for the following day. At the time of our arrival at the train station there was nothing unusual either in the area in front of the entrance to the ticket office (JPG train station) or inside where people lined up to buy their tickets. We stepped into a line with only 3-4 people waiting in front of us when a boy approached us. He was 13-14 years of age, in very simple clothes but very personable. He approached Elaine and started speaking in Chinese with her. Elaine said he offered to buy tickets for us. I replied that there was no need for that because she could speak Chinese and there was only 2-3 people in the line in front of us so we would not wait more than 10-15 minutes. However the boy was very persistent and I could see it was very uncomfortable to Elaine to tell him that we did not want his assistance. So I agreed. We gave him our money and he bought two tickets for us. But then we told him we needed a return tickets not one way tickets (we needed another two tickets). Then he took our tickets back and some more money and returned first two tickets and got another 4 tickets. So after the transaction was over I asked how much we should pay him for his effort (Elaine was speaking with him because he did not speak any English). He said there was no need to pay anything. At that point I knew there was something very wrong with that picture. Why would someone offer to buy tickets for us if we had to wait only 10 minutes to do it ourselves and later he refused the money? Well, we found out just 3-4 minutes after we thanked the boy and left the ticket office. Just after we stepped out of the ticket office door, maybe 20 meters from the door two Chinese men approached Elaine (again) flashing some sort of ID card. They were in their mid 30es wearing regular clothes (not uniforms of any sort) and what I noticed first was that Elaine felt extremely uncomfortable with the new situation. I asked her what they wanted and she said that those two gentlemen were (undercover) police officers and they wanted to know if we saw a boy buying tickets for passengers waiting in the lineups. I tried to calm down Elaine (although I did not like the situation either) and I asked her what did she tell them. She said she told them we did not see any boys doing that. The fortunate thing was they spoke with Elaine and she had presence of her mind to tell them we did not see the boy, if they asked me I would tell them what happened. Just after Elaine told me what “the police officers” wanted the boy who bought tickets for us appeared next to us, sizing us all up and continuing his walk passing by. At that moment I realized that was all wrong. If the boy was doing something wrong he would not parade in front of us, I knew that much. I told Elaine that she should tell those gentlemen we did not see anything and we had to go. So she did tell them that and we continued walking towards the subway. We did not walk far, maybe another 20 meters and the same two persons stopped us again, started speaking with Elaine again and explaining to her that the boy was giving fake tickets to passengers and that it was very important that we tell them if we saw him. At that point I was pretty sure what was going on so Elaine told them we did not see the boy and we don’t care if our tickets were fake or not, and we just turned around and went to the subway station. While waiting for the train in the subway we inspected the tickets and did not see anything wrong with them. The following day we used them and everything was fine. So what we concluded was that the boy and those two fake police officers worked together, and when the boy appeared we were expected to say: “Yes, that’s him! He bought the tickets for us!” Most likely what would happen after that the “police officers” would take our tickets back to the ticket office, got the refund (80% of the original price) and disappear. What one can learn from this episode? What I learned is that I should not believe when someone shows some kind of ID and says he is an undercover police officer (or any other official); maybe he is maybe he is not. Again, the best way to check is to ask them to go to the police station or office (I am sure there was a police office at the train station). If something doesn’t make sense (like when the boy was buying tickets for us even though we did not need it and he did not ask for money) it’s a good indication something is cooking up. But this did not help me to avoid the next scam in the list. After Elaine and I got our train tickets and avoided the previously mentioned scam at the train station in Shanghai we arrived in Hangzhou and decided to take a ride in a boat on that famed lake (the boats are just a bit similar to the Venetian gondolas, there is a gondolier with a big paddle but the gondola itself is wider). We approached a group of men standing next to 5-6 boats, apparently waiting for customers. They said the price was around Y100 or Y200, I don’t remember now, for a tour on the lake; we would stop by at different places to see the temple etc… So we agreed, but he did not ask us to pay at that point. The gentleman who was very pleasant and friendly; he even allowed me to paddle for 15-20 minutes and was greatly surprised I could keep the direction of the boat by using only one paddle. After maybe 30 minutes, after we passed underneath the bridge you can see in that picture we docked our boat next to the store selling pearls. We told him we were not interested in buying pearls but he said we could just take a look. So we did. After another 20 minutes we were waiting for him by his boat but he came and started loading another 2-3 people on the boat. I asked him if we were supposed to share the boat with other tourists, he said yes, he will drop off these and pick up some other customers along the way. I said my understanding was that we would have the boat only for two of us, after all the price suggested it would not be more than 2 people in the boat. He replied by saying those other people would not be in the boat all the time. I felt I was deceived and I said I would not pay what we agreed if other people are sharing boat with us, and I asked him to take us back where he picked us up. He was not very happy about that, he said he may be in trouble with his employer because our ride did not last more than 1 hour and he was supposed to take us to several other places and spend at least 2 hours with us. Anyway, he earned in one hour what he usually makes in two hours, we sign one of his official logs and got off the boat. The morale of this story is, I guess, to clarify ahead of time what is that you are actually buying. Don’t assume things. This is a fairly innocent scam but I thought it was worth mentioning. The following events took place in mid April of this year (2007). I was on the mini-bus on the way from the Guilin airport to the train station in Guilin. There were 10-15 people on board and the only two people who did not speak Chinese were me (I speak just enough Chinese to get by) and another passenger who turned out to be also from Canada. His name was Mr. Lan and he was a fine gentleman from Montreal, who was of Vietnamese origin but lived in Montreal for over 40 years. He retired several years ago and he was touring few countries in Asia for quite some time, Guilin and Yangshuo were his last stop before returning back to Canada where he and his family live. Soon after we entered the outskirts of Guilin the lady-conductor addressed him in Chinese but he did not understand a single word because he did not speak Chinese at all (later I was poking fun on him calling him “fake Chinese” because whenever we went somewhere together people thought he was Chinese and interpreted for me, so they would start speaking in Chinese to him). I understood we had to get off but I did not know why because I did not see the train station. Anyway, we both got off the bus, introduced ourselves to each other and proceeded walking towards the train station. Mr. Lan said he was also heading to Yangshuo first, so we decided to travel to Yangshuo together. We asked a passer by where the train station was and he explained it was just 5 minutes walk ahead and he walked with us right there. In the far end of the wide area in front of the train station we saw some parked buses and as we were approaching them the conductor yelled towards us: “Yangshuo? Yangshuo?” We said yes and got on the bus (without asking for the ticket price – which was a mistake!). Since we carried our backpacks with us we went to the rear end of the bus so that we could leave our luggage in the area between the window and the last row of seats. The conductor came up to us, we asked how much was the ticket, he said Y40 and each one of us paid Y40 (later I realized the price was most likely Y20 for each of us and he said Y40 assuming one of us will pay for both, but when he realized we would pay Y40 each he did not complain). We did not get the tickets but that’s nothing unusual in China. After five minutes or so a Chinese guy appeared in front of us. He spoke fairly good English, was very friendly, he knew a bit about hockey a bit about Celine Dion, all in all he made a good impression on us. I forgot his name (probably he told us his English name, but I don’t remember it now). Our new friend was very talkative, asked us about our lives, places we visited in China and at one point he said he owned a guesthouse in Yangshuo and he was showing us a picture of a room which was printed on a pamphlet which he folded several times so what we could see was only the picture of the room and nothing else. I asked him if he had a business card, we did not mind checking out his place too. 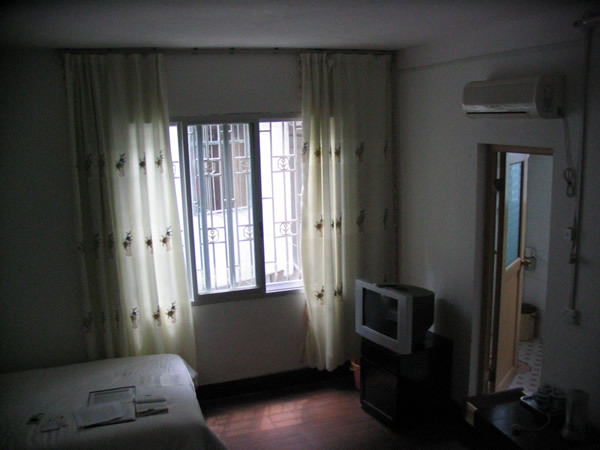 I knew that Yangshuo was a place where it is very easy to find cheap accommodation. He said he did not have a business card. 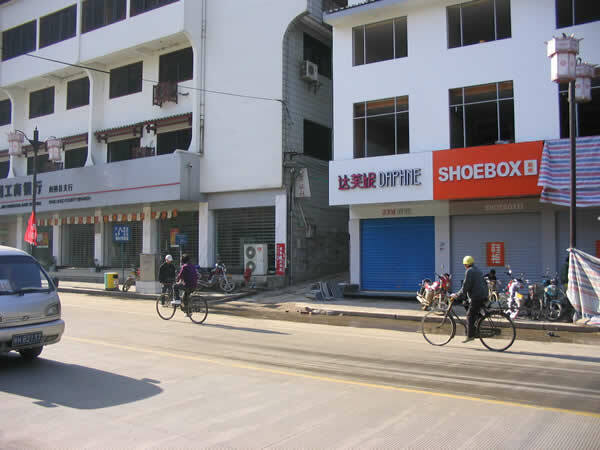 Then he asked us where we wanted to go when we get to Yangshuo, what places we wanted to check. I said I would go to the “Yanshuo Cultural House” first because I found their web site and I liked what they offered. I also mentioned one of IYH hostels. I repeated that I didn’t mind going to his place too but I could not promise I would stay there. The bus was already half way to Yangshuo (it’s a approximately 45 minutes ride from Guilin) and our ‘friend” went to the front end of the bus and had as brief chat with the bus driver and conductor, then he returned, sat in the seat in front of us and made a telephone call using his cell phone. I did not understand what he was speaking about nor did I pay any attention. The weather was very heavy, extremely humid and hot, just before the heavy rain. I was tired and sleepy. Soon we entered Yangshuo and at one point the bus driver started speaking something to Mr. Lan and I but I did not understand what he was saying. 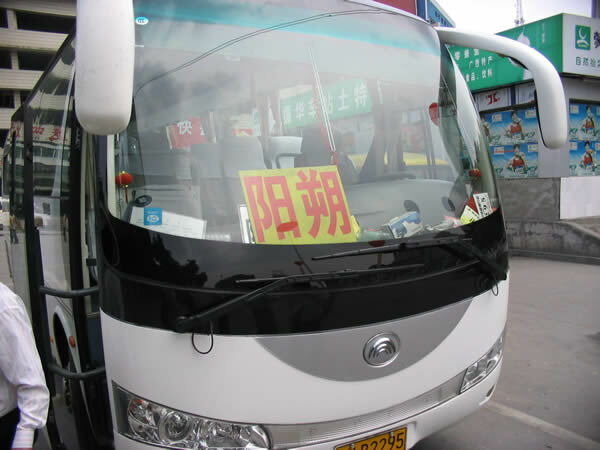 That person who was offering us rooms at his establishment said the bus was not going to the bus station, it was passing through Yangshuo and we had to get off there. So we did. All three of us got off the bus. Little did I know that the “friendly” person on the bus called his buddy Larry and told him about our plans and later asked the bus driver to drop us off exactly where Larry was waiting for us. Our “old friend” from the bus was standing aside quietly. He appeared to be surprised by my request but he wrote: “Lee” and some (fake) telephone number on the piece of paper and walked away. Mr. Lan did not participate in the conversation too much, it was obvious he allowed me to negotiate for both of us. If I was thinking clearly that should have raised my suspicion but we followed along. In the car he handed me a notebook with something what appeared to be testimonies of some “happy customers” he served earlier but I was not in the mood for reading those comments so we returned the notebook to him. After a very short ride (I think the bus dropped us off less than 500 meters before the bus station, probably right after that it pulled into the bus station) we were asked to get out of the car. Larry said we arrived and he walked us through a narrow passage between two buildings. The pathway was muddy and it looked as if the waste water was running between those two buildings. 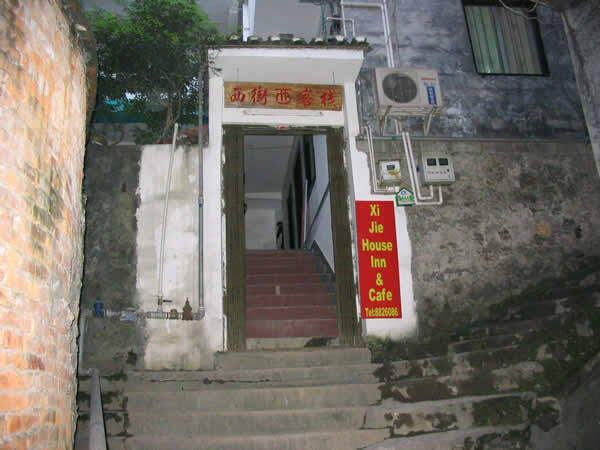 Then after 20 meters we turned left and started climbing the stairs and I saw the name of the place (the Xi Jie House Inn) so I knew it was not the Yangshuo Cultural House but I thought maybe they had some sort of arrangement with the owner of this place so I did not ask too many questions, besides I was tired, also I was getting over the cold which was wearing me down for over one week. I asked Larry how much were the rooms, he said “it depends”, I said “it depends on what?” he replied “it depends on many things”. “Like what?” I said. At that point it was obvious we did not like each other too much. He said: - “Let’s see the rooms first and then we will speak about the price”. He took us to what appeared to be the second floor and opened one room (room 303, have you noticed that rooms are numbered 303, 305 and 306?). We looked from outside and saw two beds and a bathroom/washroom door in the far corner of the room. I asked how much was that room, he said it was Y90. I asked if the food was included in the price. He said no. I said on the web site the price was Y80 and the food was included. He said that was wrong, with food the price was over Y100. - “You are my friend, I will find another room for you!” and took me one floor down and opened the door in one of the rooms and the stink of mould and dampness was overwhelming. He said: “Ok, ok, come with me I will show you another room”. We went up again and he opened another door (room 305) which was the room next door to Mr. Lan’s room and said there were three beds inside but I would have that room for myself for one night and the following day I would be able to move to the room next door (room 306) on the same floor which had only two beds. Someone was there that night and he was checking out the following day (I did see a young western tourist leaving that room, but he was not very friendly so I could not learn much from him). That was my another mistake; I did not step into the room, I just took a quick look from the outside the room, did not see anything unusual (and also compared to the room downstairs it did not stink which was misleading too). I agreed to take that room, the price was Y80 per night for four days plus Y100 deposit. I went downstairs to pay what we agreed upon, walking downstairs I asked about the Internet access, Larry replied there was no Internet access, the computer was broken. He kept pretending he took as to the Yangshuo Cultural House and at one point he was even explaining how he would be teaching us how to cook Chinese food. - “Hold on, hold on!” I said, “I would not make any plans yet, we just arrived”. - “So what would you like to do then?” he replied. - “I don’t know” I said, "I will speak with Mr. Lan first, and see what he thinks". - “When will you know?”, he said. At that point I got pissed off by that guy and I regretted I paid him for 4 days but I just said - “When we decide we will let you know!” and I turned around and went back to unload my backpack. It was late afternoon and since neither Mr. Lan nor I had lunch we decided to have dinner first and later make plans for the following four days. I put my backpack in Mr. Lan’s room along with his luggage (I left the larger part there, the small knapsack which was attached to the big one I took with me because my camera and other important stuff was in the small knapsack). We went to the restaurant under heavy rain. 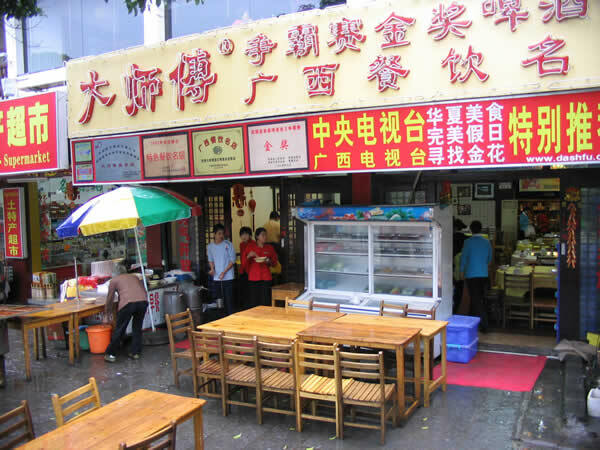 We got into the first restaurant we saw, at the beginning of West Street and paid Y30 for one simple dish which was three times what we would pay anywhere else in China. The tea they served was nothing more than warm water, we even had to pay for the use of tea cups! But that’s another story. After that we returned to the “Xi Jie House Inn” had a beer, Larry joined us and made further inquiries about our plans for the following day but we could not tell him anything at that time. We only mentioned we might need his bicycles but we would tell him tomorrow. It was around 9:00 PM when we retired to our rooms and that’s when I realized that those rooms were damp too, because I could not breathe properly. I still had cold and the strong damp smell coming from the walls irritated my lungs so I was coughing for at least 20 minutes before I fell asleep somehow. It was around 11:00 PM that I was awaken by loud pounding on my door. First I thought maybe it was Mr. Lan, something happened to him. I opened the door and there was a young Chinese guy at my door, maybe in his early 20ies. - “Are you moving to the room next door tomorrow?” was the first sentence he uttered. - “There are three beds in your room, me and my girlfriend have no place to stay, maybe we can use those two beds for the night”. Actually he was speaking more than one or two sentences but that was the main idea. I just said: - “If you need a room you will have to speak with the manager!”, I slammed the door and locked it carefully. That late night event made me pretty upset; I decided I would move out first thing in the morning. I got up at 6:00, took a shower and waited till 7:00 AM to speak with Mr. Lan who was also up early. I told him what happened, he said he will move out too because the pipe that was carrying water from the bathroom sink did not really exist so when he was washing his hands or face the water was going from the sink straight down onto his feet and continued towards the hole in the washroom floor where all water was collected. The same situation was in my washroom too. We packed up and went down to the first floor level and found one of Larry’s employees at the desk (most likely Larry was at the bus station scooping up tired travelers who just arrived by the night buses). I was holding our two receipts and told him we would like to check out but since we paid for four days we would like to get money back for the remaining three days. 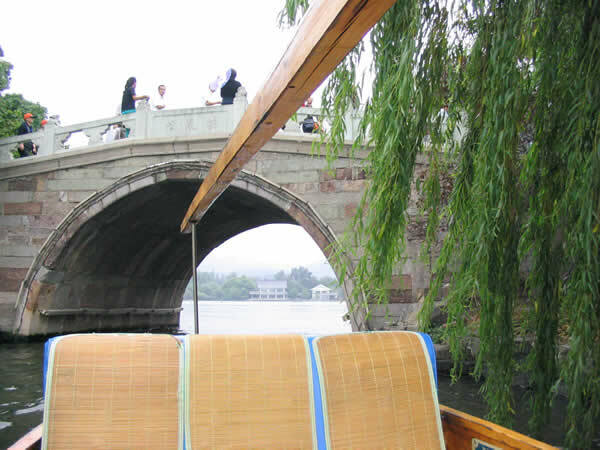 He asked why we wanted to move out; we said we decided to go to Guilin instead. He responded by saying that we could not get our money back for those 3 days, we could only get Y100 we paid for the deposit. I said that was not right and we should get back what we paid because we spent only one night at their place. He kept repeating the same thing, saying we could stay there another three days if we wanted but we could not get the money back. I realized that reasoning with that guy would not get as anywhere so I said in that case we did not have any other choice except to call the police. At that point he changed the tune a bit and made a telephone call and after a brief conversation with someone (who turned out to be Larry) he handed the cell-phone to me. Larry asked what was the matter, I explained what happened, he said we could not get the money back because if we stayed there only one night the rates were different. Instead of Y80 per night he would charge Y240 (or more, I’m not quite sure) per night so what we could get was Y100 our deposit and another Y30 back (each of us). When we calculated later he ripped us off for Y200 each, Y400 all together. At least he did not accuse us of damaging his property, so we did not have to pay for that as some other travelers have. I apologize if this account is too long but the point I wanted to make was that one should not disclose too much about their own plans to people they just met, regardless whether they are local people or other travelers. There is just no need for that. Sometimes it is hard to do that because one may feel that it is rude to turn down other person’s friendliness. Most likely they wanted to move into my room and after I fall asleep they would disappear with all my possessions (including my passport, wallet, my two cameras worth over CAD$1000) and in the morning when the police come they would ask me only one simple question: Why would you let complete strangers into your room in the middle of the night? That is where the investigation would, most likely, start and end. I have been to several cities in China and visited several provinces but Yangshuo was the only place where I did not have sense of complete security. That Larry person came across as a very bad person who could not be trusted and later I read on the LP Thorn Tree bulletin board that other travelers had similar experiences. 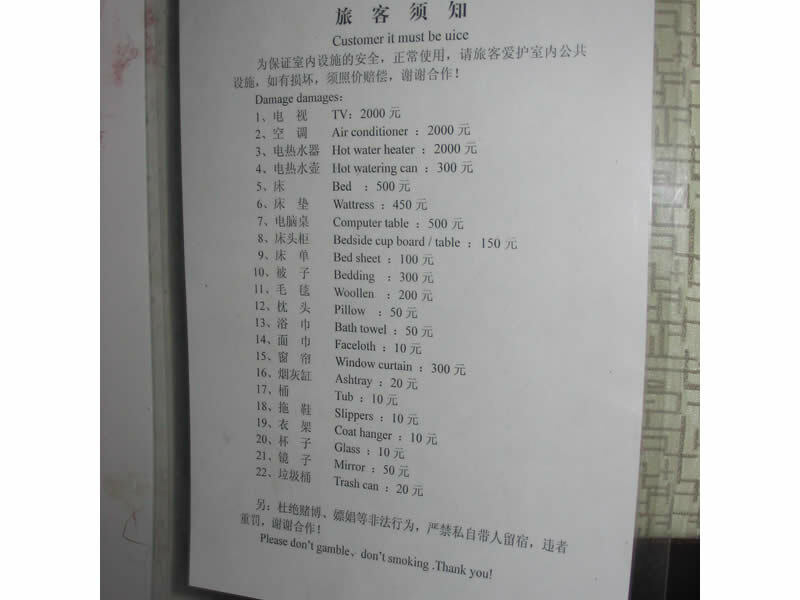 Stay away from the “Xi Jie House Inn”!!! 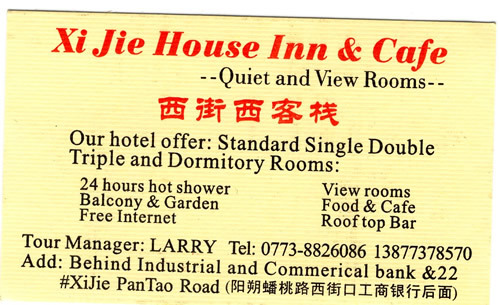 I hope the story about Larry and his “Xi Jie House Inn” will serve as a good example to all of you heading to Guilin and Yangshuo; be careful, when you go on a bike ride through the countryside around Yangshuo don’t go by yourself, rather join a group. Don’t follow anyone who is offering you accommodation or any other tours, try to organize those yourself (with other travelers). A few years ago a foreign tourist got killed near the Moon Hill in Yangshuo and I am not surprised all that much because what I witnessed first hand in Yangshuo was overwhelming desire of local population to rip off tourists. In case of Yangshuo the desire to get the money is often pretty darn close to arm robbery. The nature is amazing, though! Not everyone is like that, of course. 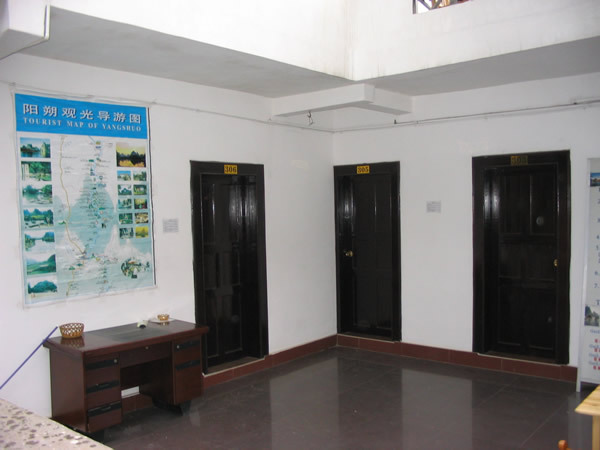 The day we moved out from the “Xi Jie House Inn” we met with the guy who runs the Yangshuo Cultural House and he was extremely nice person, he met us in the town, we told him about Larry’s scam and he said he would update his web site and warn visitors. Later Mr. Lan and I moved to another hotel and got nice rooms for Y100 each and everything was back to normal. 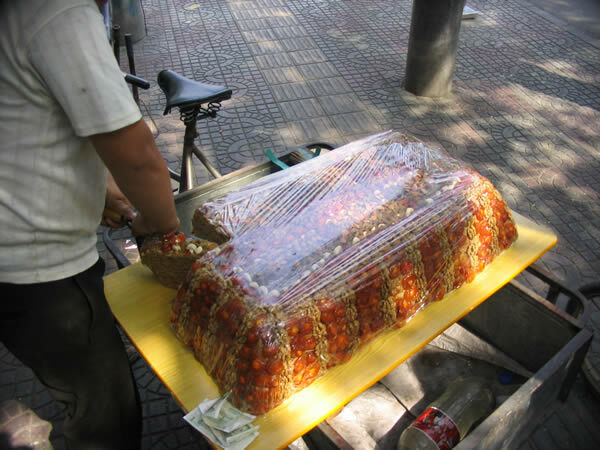 Walking down from the Forbidden City towards the Temple of Heaven in 2005 I came across a street vendor who was selling some sort of sweets, which appeared to be mixture of dried fruit and nuts. The day was very hot (over 35 C) and I was not in the mood for sweet food but he was persistent. I asked him how much was one small piece (I was using my poor Chinese but I knew how to ask that), he said it would cost Y3. I said, that’s ok but I need a very small piece. At that moment I took Y3 out from my wallet and put it beside that big granola pie (see the picture) and he cut one huge piece. - “No” he replied, “it’s Y50!" I said "Y50!”. “I’m sorry, you said Y3 and I left Y3 here” and then I took my Y3, (did not even touch his sweets), turned away and left. He and his buddy (who was selling the same thing) were yelling after me but did not try to catch up or threaten me (sometimes that’s what happens). Most tourists don’t speak Chinese and scammers won’t even try to speak English because when they say the price later they can pretend they said the amount which was 10 times the original price because in Chinese, for example, fifty is pronounced as “five ten” (wǔ shí); first they say (wǔ), later they will just ad 10 (shí) and try to convince you that you did not hear correctly. In cases like this it can help if you ask for the price, write it down on a piece of paper, show it to the vendor and ask him to confirm and then proceed with the transaction. 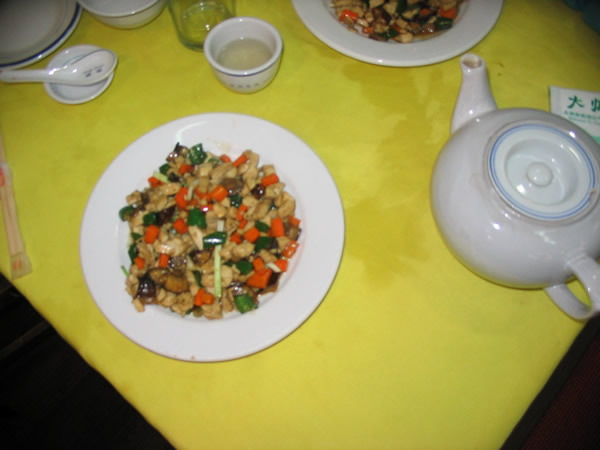 - in the restaurant, when you ask for menu in English the prices in that menu will be considerably higher than those in the menu printed in Chinese.